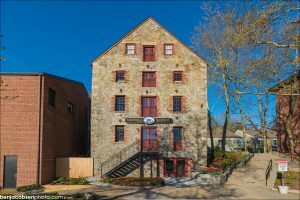 NCA recently earned a 2016 Rhody Award for the restoration of the historic Earle Warehouse (ca. 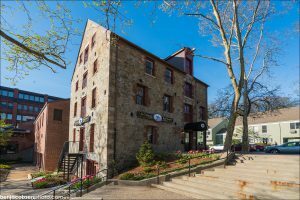 1784) located on South Main Street in Providence, RI. The landmark houses Lila Delman Real Estate International’s new Providence office. Each year, Preserve Rhode Island partners with the Rhode Island Historical Preservation & Heritage Commission to honor those who make a difference by protecting Rhode Island’s historic places. More than 300 of Rhode Island’s community leaders, business people, homeowners, preservationists, industry professionals and craftspeople celebrated the Rhody Awards at Rosecliff in Newport, RI. 369 South Main Street in Providence has been at the crossroads of Rhode Island’s commercial history for more than 200 years. In 1770, Deacon Joseph Sheldon purchased the parcel and built a 144-foot wharf on the Providence River, a dwelling, cooper’s shop and a warehouse. That same year Sheldon transferred ownership of the property to his son Christopher Sheldon. In 1801, a fire destroyed most of the structures on South Main Street and the remains of the Sheldon warehouse were rebuilt. In 1810 a Sheldon heir sold the building to George and Oliver Earle who continued to use the structure as a warehouse for nearly two decades. Between 1817 and 1824 Carlo Mauran and Joshua Mauran rebuilt the warehouse. The three-and-a-half story, 5,000 gsf structure is an early example of a large masonry warehouse. Architectural characteristics include an exterior with random laid rough cut stones, iron doors openings fit with heavy stone lintels and brick framing, double hung windows fit with iron shutters and hardware, brick cornice with brick dentils, and a slate roof laid in mortar for fireproofing. The interior features wide planked flooring, rough stone walls, and a heavy longitudinal girder on wood posts along the center of each floor. Later in the 19th century, a brick façade and storefront were added to the building. From 1856 to 1939, the Ferry Coal Yard Company and the National Coal Company stored coal in the building. During the 1940s and 1950s the RI Covering Company used the building for their steam pipe coverings business. In the 1960s, the City of Providence took the building and adjacent block by eminent domain to make way for urban renewal. During the 1970s the building was sold to Sulzberger Rolfe and Plantations Associates and adapted for use as offices. In 1977 the building was listed on the National Register of Historic Places as part of the College Hill Historic District. 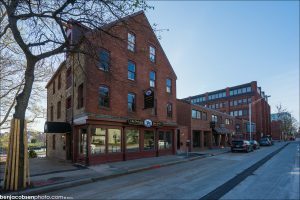 NCA worked closely with the new owner of the historic building to create a modern real estate office with a single apartment that retained the building’s historic character. The project entailed bringing the building up to code, removing non-historical partitions and furred walls, removing non-historical ceilings to expose the warehouse’s historic timber framing and installing new wooden flooring. The exterior work included removing bricks that concealed original window openings and loading doors and installing period appropriate windows. The design team also removed multiple enclosed stairs to allow direct exposure to the windows for harvesting daylight, added new copper gutters and downspouts, and replaced the failed slate roof with a historically sensitive synthetic slate. As a significant historic structure within the College Hill Historic District, the project received Federal Historic Preservation Tax Incentives with a 20% tax credit. The project also received a 25% tax credit with the 2013 Historic Preservation Investment Tax Credits for Rhode Island for the qualified rehabilitation expenses. 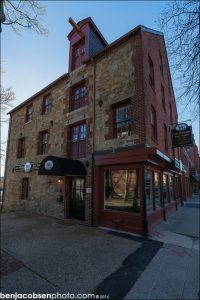 This project became a reality with these historic tax incentives, and has become a showcase for the owner and their commitment to preserving history in Providence. Design Team also included: LDRE Properties Providence, LLC – Melanie Delman & John Hodnett; Suburban Renewal, Inc. and Ben Brungraber, PH.D, P.E.